Integral to Special Olympics is a dedication to empowerment and dignity; the Athlete Congress is the epitome of that effort. Athletes who take part are nominated by their peers; HOD’s, coaches and voice the opinions and concerns of their fellow athletes and volunteers within the structure of a committee structure. 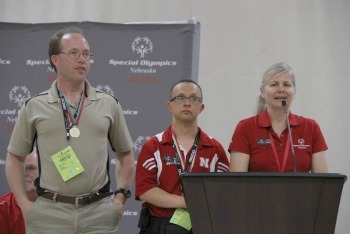 The Athlete Congress is a forum where delegates with intellectual disabilities from throughout Nebraska work to recommend policy and set direction for the Special Olympics movement. The Athlete Congress, with the 10 inaugural members representing different regions of the state, will converge at Fall Games. On the agenda is discussions around the Big Red Raffle, Healthy Habits and the importance of service club membership in their communities. •	Attend Nebraska Legislative Day which acknowledges the citizens of Nebraska who are intellectually disabled. •	The Athlete Congress meets four times annually.